Apple Computer makes cool computers. In the business world, that's not necessarily a good thing. But when racking up 1,566 Apple Xserves, cool--in the thermal sense of the word--counts. 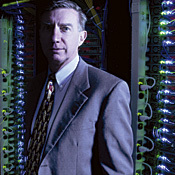 Defense contractor Colsa Corp. buys high-performance computer clusters for the U.S. Army. That means competitive bidding, as in the case of an Army supercomputer project that went up for bid in April. With requirements that specified footprint, power-management options, and a peak performance of 25 teraflops--computational speed surpassed by only one supercomputer in the world as of August--the company fielded proposals from six major vendors. "Apple won on technical [merits] and cost," executive VP Anthony DiRienzo says. Colsa's Xserve cluster draws about a third as much power as systems that were proposed by Apple's competitors, executive VP DiRienzo says. Apple did a great deal of engineering of its Xserve 1U nodes, DiRienzo says. The company has driven the power consumption down considerably, and it has done a lot of sophisticated engineering to get the heat out. "We've been racking up a lot of different types of these clusters, and [with] a lot of them, once you put 30 of them in a rack, you can't turn them up to full power because they can't dissipate the heat," DiRienzo says. about half a megawatt of power. The systems proposed by the competition required up to three times that. As a consequence, some of the competing systems required more processors, which drove up the cost. Apple--cost competitive? The Army was as skeptical as anybody familiar with the business-technology market, DiRienzo says, asking the usual questions: "Why are you going to put it on Apple? They're more expensive. Are you going to get the same thing out?" But the project worked so well, "they were very supportive of us as we went through this solicitation and this acquisition," DiRienzo says. "They're happy with the performance that the Apples should give." They're especially happy with the price tag: $5.8 million. The next-closest bid came in at $7.4 million. The difference isn't simply that the G5 chip draws significantly less power than competing chips, says Alex Grossman, director of hardware storage at Apple. Through its control of hardware and software, Apple has been able to design custom input/output components that allow the use of more affordable, more energy-efficient disk storage without sacrificing data transfer speed. "Our Serial ATA [has] three 7,200-rpm drives in there, which draw less than half the power of SCSI drives that most people use and generate half the heat," Grossman boasts. "We can get similar performance to what people get in 10,000-rpm SCSI drives. And in a lot of cases, we approach what they get with 15,000-rpm drives." And the costs stay low. "The cost is really a commodity-cost level," Grossman says. While the challenges of high-performance computing aren't necessarily familiar or germane to the average business-technology manager, cost is one element that bedevils buyers of supercomputers and single CPUs alike. And true or not, Apple has long been perceived as the costlier option. The fact that Apple enjoys a gross margin of around 27%, about 10 percentage points higher than Dell's, doesn't argue otherwise.